Looking for some public information from IoT devices? The guys over at thingful.net have established a search engine for The Internet of Things. You simply need to specify the type of information you are looking for an a location. A number of hot-spots will appear which you can browse to your hearts content. Thingful organises 'things' around locations and categories and structures ownership around Twitter profiles (which can be either people or organisations), enabling citizens to discuss why and how they are using their devices and data. Because, the 'who', 'why' and 'where' are ultimately far more important than the 'what'. The website is really just an index of publicly known sources of information - it doesn't store the information from the devices itself, it simply collects metadata and references that others can obtain and query directly from the original source of information. 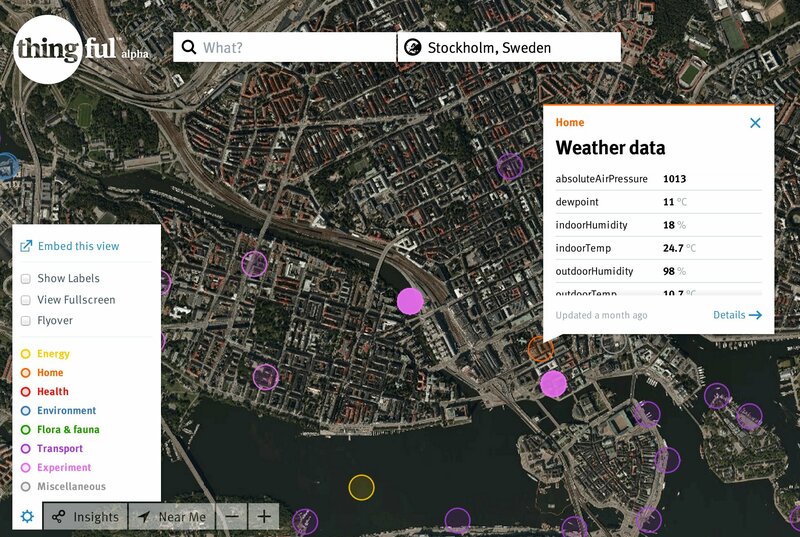 As a developer you can use the service to browse for public Internet of Things sources, find out which locations have dense (or sparse) sensor coverage and figure out which devices are most popular and where they are. With the right amount of information that can be marked as reliable a number of IoT applications could be created using such information. As a individual who has connected devices and is willing to share the information they offer you associate them to your profile and let people know why and how to use such information - or find out who has similar device types or find devices nearby or a specific location.